I think you made the safe decision of landing on a good spot. You only had 13% battery left when you landed. Perhaps if you continued returning it would have dived in the water. So, I think you were right to play safe and were lucky, as a bonus, to be able to land it in a place where you could retrieve it. I support your choice 100%. I wish I had balls like this. If you fly just little further, you won't be able to see it at all and I start getting really nervous. It's like you let $1000 fly around and are hoping it to come back…. That was the oddest video ever. You could have easily made it back. Also why didn't you just let it RTH without touching the controls? Not stupid at all. But here's my thoughts. You flew to a distance or about 16K feet. But that's the distance in a straight line. You flew a kinked line, could have easily added 1,000 feet. Then when you returned, it might have helped to drop some altitude to get out of the wind. Entertaining though. Thanks for posting. I'll go check out more of your videos. 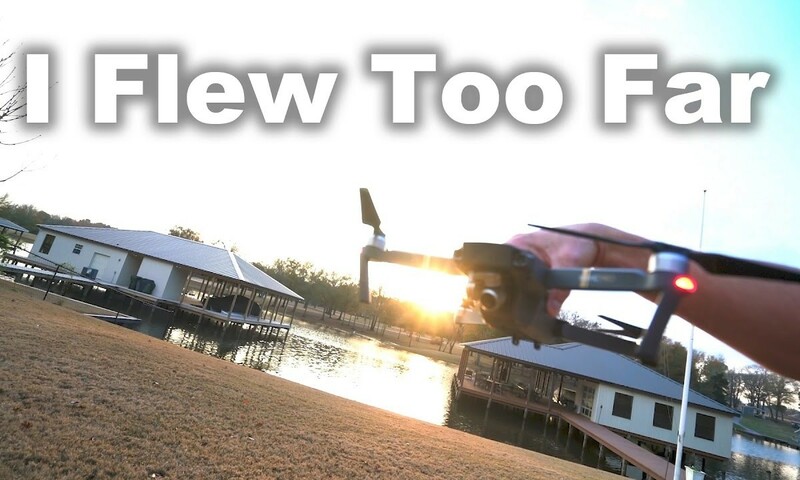 I’m new to drones but if I’ve learned one thing it’s if you’re going to do a distance test fly into the wind first! The part that gets me most is people flying them beyond LOS and expecting nothing but rainbows and unicorns in the end. But you nearly always hear the panic in their voice towards the end. good you landed. so many takes a chance. i will make it, then splash and drone wont work again. best to land somewhere dry. tried the same thing over water. from the flight logs my battery was having an issue cause it dropped 5v in10 sec. I lost mine over water 300 feet away from me. it autolanded and i could not get it out of that mode. you so funny man… sorry but your video have made me laugh. well done any way. Today I almost lost mine in a 6 mile excursion. "Aircraft disconnected" I had the CJI goggles on (which somehow were working) so I flew back to my 'woods' with literally one sec left to RTH (near the precarious trees). Live, learn, and be blessed I guess. So glad to know I'm not the only person who's had to sit there waiting 39 minutes for a firmware update! (in my case, in a park surrounded by people and children coming up to me asking when I was going to start flying and leaving after 2 or 3 minutes of conversation after they got bored waiting). But I've learned my lesson the hard way: ALWAYS check for firmware updates before leaving home! Return to home would have been much more efficient coming back after going the distance.. straight line back. Which had your more nervous, this flight or when you did the manual prop shutdown mid flight? My Mavic Pro loses signal and image at around 6,000ft. While he was driving to the landing spot,it had taken off again and was going home. The battery died enroute and he lost it over a cliff.